From How the Grinch Stole Christmas. 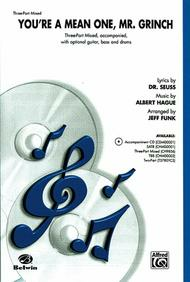 Composed by Albert Hague. Arranged by Jeff Funk. Performance Music Ensemble; Single Titles. Alfred Pop Choral Series. Christmas; Movie; Novelty; Secular; Winter. Choral Octavo. 8 pages. Belwin Music #00-CH9856. Published by Belwin Music (AP.CH9856). When Dr. Seuss' classic book "How the Grinch Stole Christmas" became a TV holiday special, the music helped make it a big hit! This title song is hilarious and kids of all ages will love it! Jeff has done a great job at making the lyrics and rhythm very easy to sing. A fabulous novelty addition to any holiday concert.